Following the release of Mario & Luigi: Superstar Saga + Bowser’s Minions in 2017, the developers at Alpha Dream began working to remake Mario & Luigi: Bowser's Inside Story in a similar fashion. 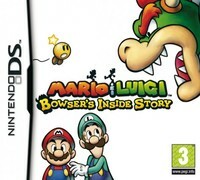 This re-release, titled Mario & Luigi: Bowser's Inside Story + Bowser Jr.'s Journey, offers the same do-over treatment for the third game in the series, with similar additions and changes from its original version on Nintendo DS. The premise of Bowser's Inside Story is an amusing one. A seemingly new disease has begun spreading across the Mushroom Kingdom known as The Blorbs, which inflates any affected by it into a large bloated ball of a body. 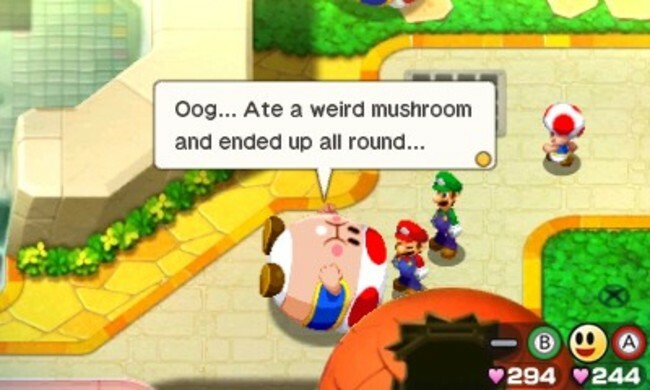 Bowser, meanwhile, is tricked into eating a Vacuum Shroom, and then proceeds to swallow Mario, Luigi, Princess Peach, and others into his own body. With the heroes out-of-the-way and most of the Kingdom unable to move in their blorbed state, returning villain Fawful takes the opportunity to take over Peach's Castle in a nefarious plot for power. The game then follows in essentially two different modes. Part of the game has the player controlling Bowser as he navigates the Mushroom Kingdom, and the other part of the game has Mario and Luigi bouncing around in different regions inside of Bowser. Combat in either mode is comparable to the turn-based affair found within the rest of the series. For each action selected by the player, you can time a button press at some point during the animation to increase the damage done. 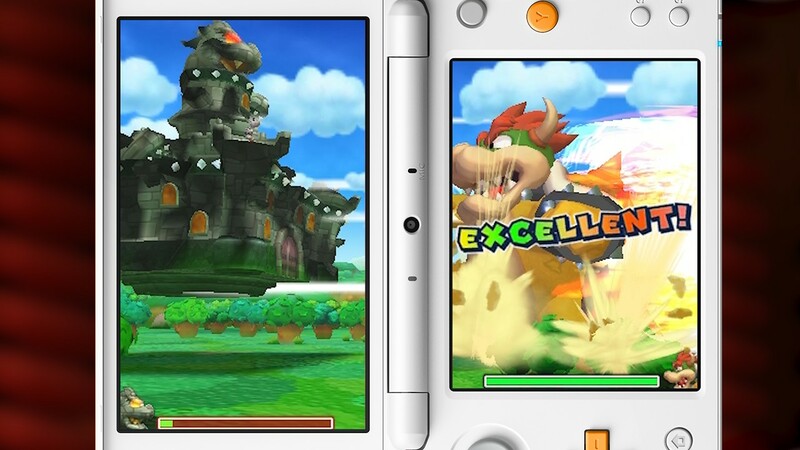 The only difference here is that instead of jumping and hammering, Bowser can throw punches or breath fire. He can even inhale certain enemies into his own body, and from there Mario and Luigi can then take on these swallowed foes from within. It's a snappy, simple, and fun combat system. Like many other Mario RPGs, Bowser's Inside Story is an extremely charming title, only this time giving Bowser significant screentime of his own as a protagonist, however brash he might be. While later games in the series - Dream Team and Paper Jam - either suffer from poor pacing or dull scenarios, Bowser's Inside Story manages to keep a good pace with fun and zany situations, and it doesn't overstay its welcome. When it comes to the gameplay and storyline components, the 3DS remake is very similar to the original version outside of a few minor changes. One of the best additions is that of a fast-forward option, which works to slightly speed up some of the character animations in cutscenes - a welcome addition to be sure. Otherwise, some item box contents are different, beans locations have been tweaked slightly, hammer counters are a bit easier to pull off, and some Bros. Attacks are slightly tweaked, but this is largely the same game in a new coat of paint. To be frank, many of my comments and critiques about Mario & Luigi: Superstar Saga + Bowser’s Minions remain the same here. Most significantly, there is a change in artsyle from the original 2D Nintendo DS sprites to a style used in later Mario & Luigi games. This newer artstyle has a nice fluid look to animations, and it appears better on a 3DS screen than the screenshots in this review might indicate. However, personally, I still feel that it shaves a bit of the visual charm away from the original. The art shift is not a subtle change, and this alone might sink your potential interest in picking up the remake if you simply don't like the new look - which is totally understandable; those original sprites are hard to beat. There are a couple of ways in which Bowser's Inside Story is structurally different from SuperStar Saga. It contains more minigames throughout, usually involving Mario & Luigi working inside of Bowser to relieve some affliction or issue. Each minigame alone isn't too much of a hassle, but there is a fair number that you'll end up playing - several of those you have to clear multiple times which can be a little draining. There are also a handful of Giant Bowser battles dotted throughout the game, in which you hold the 3DS system sideways to play through a stylus-controlled spectacle battle. For as snappy as rest of the game is, it's unfortunate that these battles are so slow in comparison. The pace here seems somewhat intentional as if to really provide that feeling of a gigantic creature lumbering around in some sort of Godzilla-like clash, but ultimately every time I encountered one of these events, I just wanted it to be over with. Luckily there aren't too many within the game. 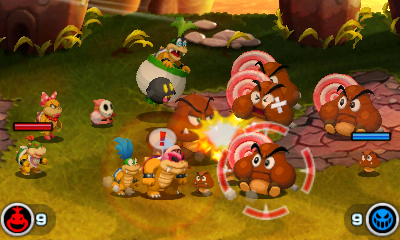 Much like the SuperStar Saga remake, we once again are given a new subgame mode, this time featuring Bowser Jr. This plays near identically to the Minion Quest mode in the previous remake, keeping a strategy/simulation type of gameplay style compared to the turn-based combat of the main game. While the character focus on Bowser Jr. here is more interesting than what was attempted in Minion Quest, this mode is still not actually compelling enough to recommend. This subgame places focus on Bowser Jr. as he tries to impress his father by solving the Blorbs problem that the minions are also experiencing within Bowser Castle. Over the course of this mode, Junior slowly learns a lesson about how he treats the minions and the Koopalings, ultimately learning to be more of a team player. Aside from that, the battles here get repetitive quickly, and the overall structure of the mode fluffs it out to a length much longer than it needs to be. In order to reliably succeed through these battles, you either have to spend some time micromanaging your squads before each battle or spend some time powering your men up by repeating skirmishes more than once. Either way, it leads to a tedious experience that's really just not worth your time. 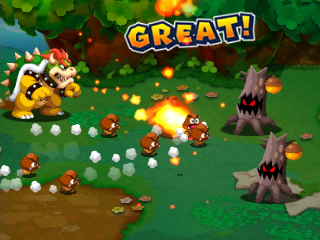 Personally, I'd suggest skipping this mode altogether, as it has no bearing on Bowser's Inside Story. Mario & Luigi: Bowser's Inside Story is a highlight of its series; an addictive and snappy game with a lot of charm, but it is a bit difficult to say that the remake improves on it in a considerable manner. Still, it's a fine way to experience a great game nonetheless, but the art change might leave you cold, and the new Bowser Jr. mode doesn't add much value to the package.